With pins featuring Edward Cullen, Bella Cullen, Jacob Black and Renesmee Cullen fans of The Twilight Saga: Breaking Dawn Part 2 are going to want this pin 4-pack. Photos of Robert Pattinson's Edward, Taylor Lautner's Jacob, Kristen Stewart's Bella, and Mackenzie Foy's Renesmee grace the front of these cool looking pins. 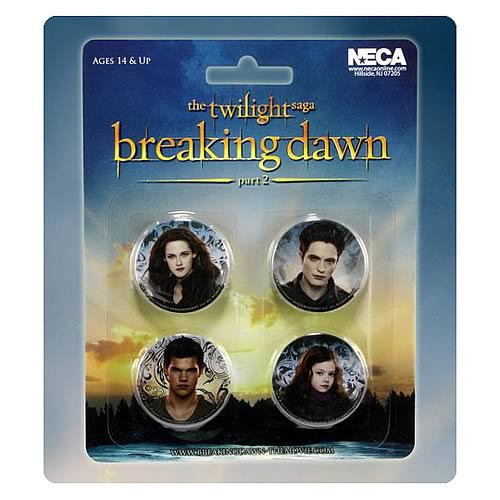 The Twilight Breaking Dawn Part 2 cast pin 4-pack is a must-have for The Twilight Saga fans! Ages 14 and older.